The list of big banks liking gold continues to get bigger. Even the biggest naysayers are favoring the yellow metal now. This could be great for gold prices. Its opinion changing on the yellow precious metal shouldn’t be disregarded at all. Mind you, the list of big banks turning bullish on gold continues to grow. TD Securities—an investment bank under major Canadian bank Toronto-Dominion Bank (NYSE:TD)—is bullish on gold prices going into 2019. Any meaningful rally is likely a story for late 2019…the US dollar’s strength relative to G10 and EM currencies is likely to remain a significant headwind that will suppress positioning for gold bugs. We expect prices to be well contained, before trending into the $1,300s in the latter part of 2019. Why Should You Watch the Big Banks? Don’t forget that big banks have a lot of influence on institutional investors. These banks themselves manage a lot of money too. As they turn bullish, it’s possible that those with money start to pay attention to gold. The yellow precious metal has been relatively ignored over the past few years. With this, even if a small sum of money is allocated toward the yellow precious metal, we could see gold prices soaring immensely very quickly. Remember, the gold market is small, and you really don’t need a lot of money coming in for gold prices to go higher. Dear reader, this is a bold claim but I will make it: the gold market in the next five years could be a lot different than the market in the last five years. We could see gold prices soaring. However, I don’t think the real opportunity would be in just owning gold bullion. Gold mining stocks could be where investors make killer profits. Year-to-date, as gold prices have come down 6.58%, mining stock have dropped 16.82%. For every one-percent decline in gold prices, mining stocks fell 2.56%. If you look at the long-term chart, the decline in gold mining stock prices has been much more severe than the decline in gold prices. 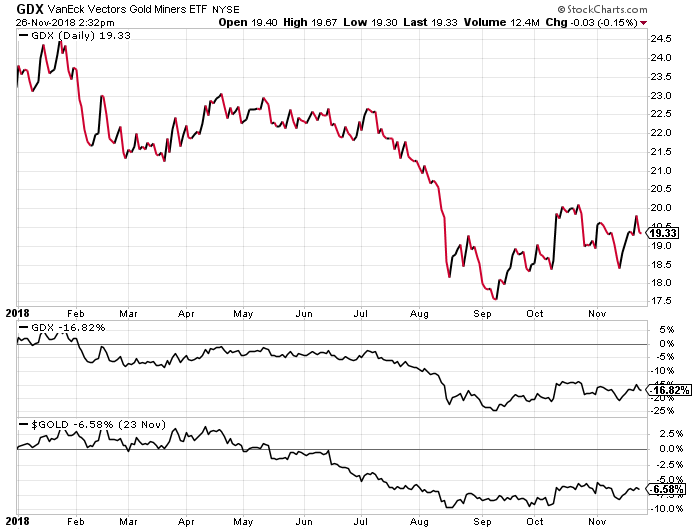 In case there’s an upside, I expect mining shares to outperform gold prices on the upside. I see them selling for pennies on the dollar relative to yellow precious metal prices. They are ignored for all the wrong reasons.